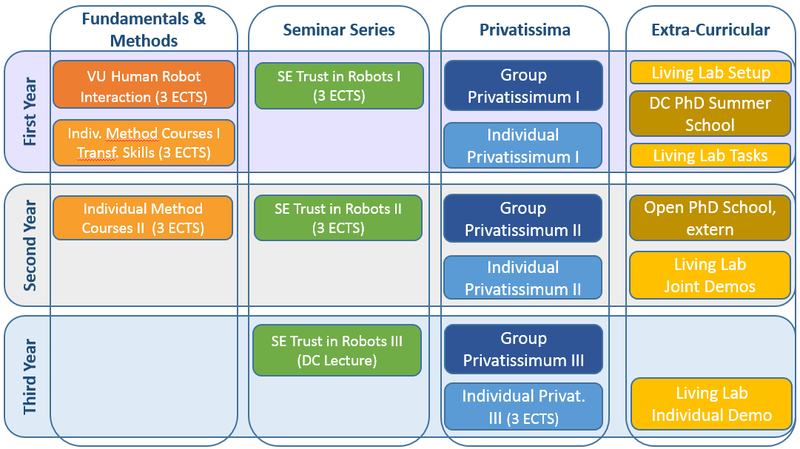 The Curriculum for the doctoral college TrustRobots reflects the transdisciplinary topic and approach, organises intensive supervision and collaboration of the PhD students, provides possibilities for close work with robots and opportunities for networking as well as being established in the scientific community. Fundamentals and Methods introduces common ground in HRI, adds complementary transferable skills (team building, inter/transdisciplinary research, etc.) and an open specialisation. The DC will establish a Seminar Series the will evolve its pattern of the three years. Privatissma go into depth. In addition, extra-curricular measure foster collaboration, creative approaches, and synergies in collaborating in a joint space such as a Living Lab.